MegaPodTastic : MegaPodzilla # 29: She Can Touch your Lobes, but Never your Latinum. MegaPodzilla # 29: She Can Touch your Lobes, but Never your Latinum. Dave & Joe are joined by Jerad Formby, a former cast member of 'Star Trek: The Experience' in Las Vegas. For 8 years Jerad played Ferengi Liquidator Quan of the Ferengi Commerce Authority. In August of 2007, Quan was a guest at Krazy Joe's wedding !! 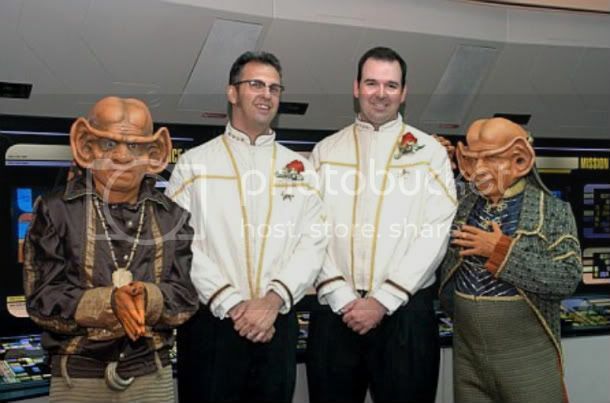 Jerad shares some great stories and memories of his time as a Ferengi in Vegas! You won't want to miss this! In the Prediction Network, Krazy Joe and Dave talk about Nicolas Cage's latest film, 'Drive Angry', Johnny Depp in 'Rango', and the 80s comedy, 'Take Me Home Tonight'. To hear more of Jerad Formby, be sure to listen to him on the 'Trek Cast', and 'Geek Fights' podcasts, available at the links below! While playing the Ferengi character, Quan, in Las Vegas, Jerad inspired a fanclub called 'Quan's Fangirls'. Check out their site linked below! Awesome podcast guys! I hadn't heard of you before Jerad posted on Facebook that he'd be on, but I will definitely be listening to more episodes.